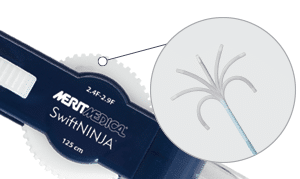 SwiftNINJA, a straight tip catheter that articulates up to 180 degrees in opposing directions to rapidly select the most challenging vascular ostium. Speed, Control and Delivery at your fingertips. The unique ergonomic steering dial allows the catheter tip to be deflected from straight to opposing directions up to 180 degrees. Provides In Vivo steering control. Able to cannulate difficult anatomy with the catheter tip for embolic delivery. Once the catheter is shaped into a curve, when you torque the catheter and advance through the vasculature, this provides “3D steering” as you are moving in 2 planes at the same time. Once the tip is positioned at desired location, it can be ‘locked’ to hold the shape in that position. The tip will remain positioned for embolic placement without the worry of recoil, loss of position or embolic displacement. Braided shaft enhances shaft support and provides pushability. 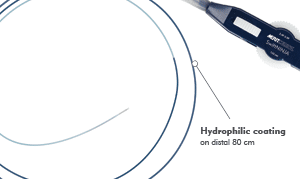 Hydrophilic-coated distal 80 cm, a braided shaft for pushability, and distal tip deflection ensures successful delivery of the catheter to the desired location. 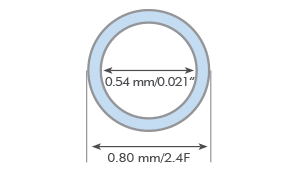 Two radiopaque marker bands for enhanced navigation and tip placement. 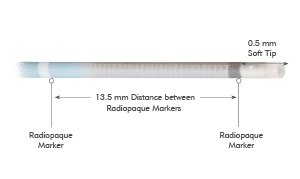 The SwiftNINJA Steerable Microcatheter, the only 180° articulating microcatheter on the market, is becoming the “work horse” tool for physicians in appropriate situations. A case study about the SwiftNINJA as the “work horse,” rather than the “problem-solving” device was published in the May 2017 issue of Radiology Case Reports. Read more about the case here. 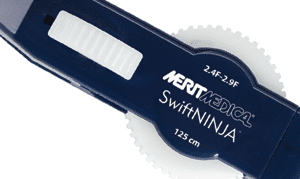 The SwiftNINJA can lead to additional patient and clinician benefits, including reduced operation time, X-ray exposure and the amount of contrast medium used in a procedure. 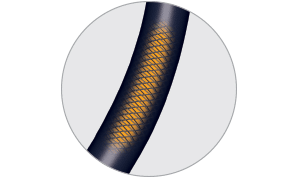 A case study reviews the advantages in the successful embolization of post-EVAR type II endoleaks using the SwiftNINJA. The most advanced and only 180° articulating microcatheter on the market today. Speed, Control and Delivery at your fingertips. Allows opposing 180° articulation from the straight position. 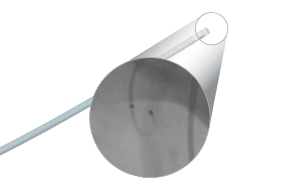 Once shaped, tip can be locked in position or re-directed to prevent recoil effect during embolic delivery.